Engineering documents, drawings or models contain a lot of specific information that needs to be found urgently. The limitations of the Windows folder structure soon becomes apparent. 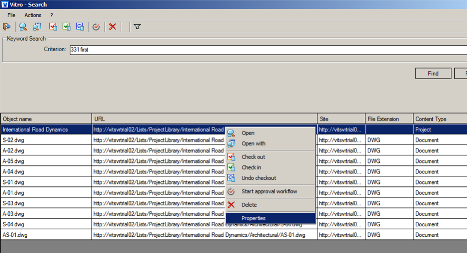 As with any engineering document management solution, VitroCAD allows users to perform searches using file names, project numbers, creation dates, and other features. The most appealing feature of VitroCAD search function is the ability for users to search any text contained within a document. Supported document types include DWG, DGN, Word, Excel, PDF, PowerPoint, and many more. 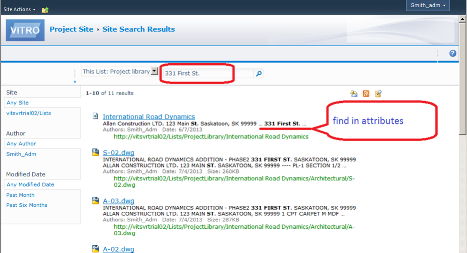 Being able to search by attribute, content, keyword or metadata is a key benefit offered by VitroCAD.